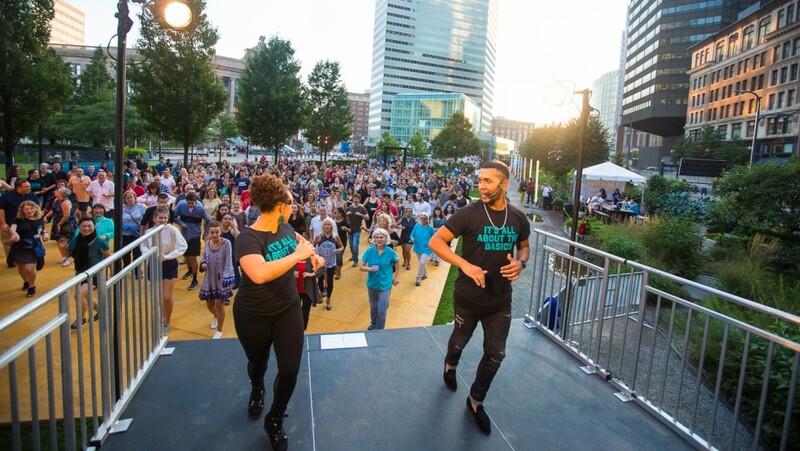 Thanks to all who joined us at the Rose Kennedy Greenway September 13-17 for Let’s Dance Boston 2017. We danced, we laughed, we made new friends, and some of us even got soaked! Despite some cool rain, the dance floor was hot all week, and we had a blast learning some new dance steps from our fantastic teachers. First appearing on the Greenway in 2015, Let’s Dance Boston is one of the most vibrant free outdoor dance and music parties ever to take place in the city. 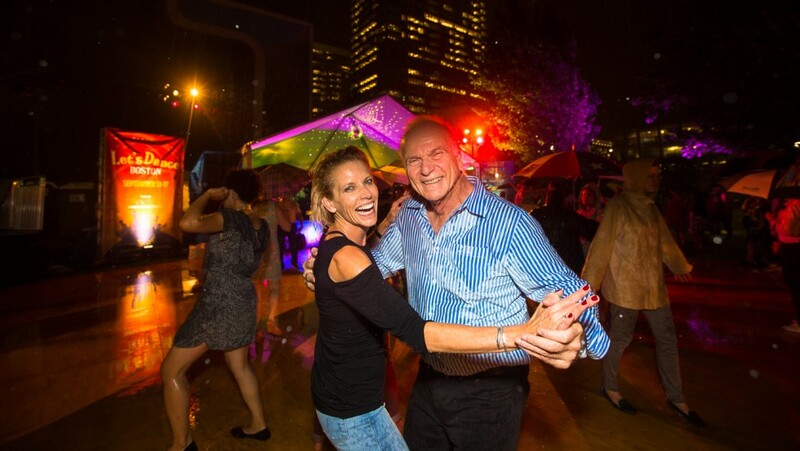 In 2017, Let’s Dance Boston moved down to Dewey Square Park on The Greenway for four consecutive nights of dynamic live music and dance along with a special Sunday afternoon event, in association with the Jewish Arts Collaborative. Bostonians from across the city participated in the free dance party. 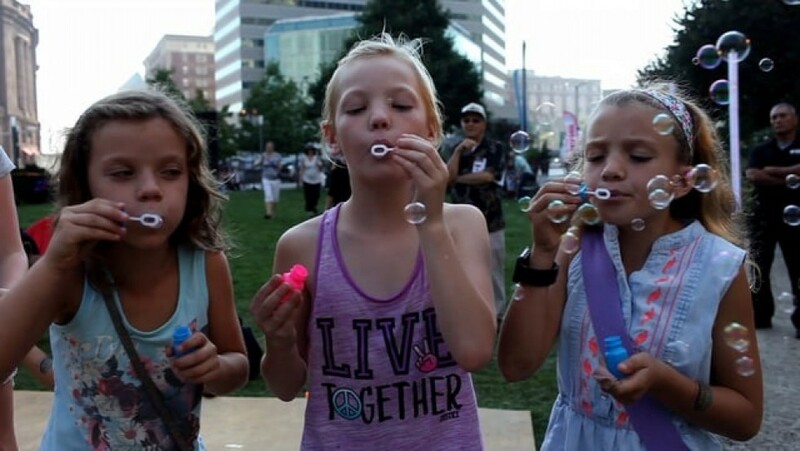 Fun for all, the five-day dance extravaganza included five different live bands preceded by expert dance instructors. Each event began with a 45-minute free dance lesson taught by professional teachers in the dance style of the evening. After the lesson, a live band performed a 90-minute set to accompany the dancing and continue the party. Be sure to share your videos and photos using #letsdanceboston. You can also relive the fun with Celebrity Series on Facebook, Twitter, or Instagram! Visit our season calendar or our free Neighborhood Arts performance calendar to learn more about all of our 2017-18 offerings! Our Salsa instructors, Jenna Robey and Luis Talavera Díaz, teaching a group lesson. Having fun at the Friday night Disco in the rain! MASSabda, Dance Complex, Boston Dance Alliance, Charles Baldwin at Massachusetts Cultural Council (MCC), Aysha Upchurch at VSA Mass, Wooden Kiwi, Hop to the Beat Dance Studio, Boston Swing Central, The Boston Lindy Bomb Squad, Boston Lindy Hop, The Riff Academy, and Michael Winward from Steps in Time. From the Lindy Hop to the Charleston, there is a vibrancy and excitement to Swing that will be evident as Michael Gamble and the Rhythm Serenaders, featuring Laura Windley, take the stage. This hard-swinging and stylistically faithful ensemble, created in the mold of the late 1930s and early 1940s dance bands, performs arrangements popularized by bands led by Fletcher Henderson, the Coleman Hawkins All Stars, various Duke Ellington and Lionel Hampton side groups, the Dickie Wells and Willie Bryant orchestras, and more. Partners in life and dance, Katie and Paolo Piselli bring more than 15 years of experience in social dancing to the dance floor as they share the basic movements of swing. Profiled as “The Future of Mambo” in La Voz del Mambo magazine, Ana “Masacote” Tinajero joins Gastrell Rossignol, a Latin dance instructor, to teach the basic moves of Mambo. The Loser’s Lounge is a collective of New York City’s finest performers founded in 1993 by former Psychedelic Furs keyboardist Joe McGinty. You bring the moves, they’ll bring all the greatest hits of the ‘60s, ‘70s, and ‘80s. Rob first caught the bug of choreography at an early age, it all started within the competitive world of Line Dancing. As a professional dancer himself, Rob is well versed in ballet, tap, modern, jazz, latin, ballroom, american rhythm & smooth, double work (pas de deux) lyrical dance & contemporary in both the Imperial Society of Teachers of Dance (ISTD) and Royal Academy of Dance (RAD) Syllabi. We enjoyed the sounds of Orquesta SCC “La Excelencia,” a salsa dura orchestra based in New York City. The 11-piece big band is world-renowned for breaking from many unnecessary traditions in order to recreate the genuine Latin style and sound in a manner that befits the modern era of music. Jenna & Luis are Latin dance instructors, choreographers, directors, and performers. Their mission is to continue to grow the Bachata dance scene in Boston one dancer at a time. They want to take our infectious love for dance and teaching and spread it around to anyone and everyone willing to learn. Their overall goal is to learn and have fun. Let’s Dance Boston concludes with an afternoon of Klezmer, offered in association with the Jewish Arts Collaborative. The day features the sounds of Alicia Svigals’ Klezmer Fiddle Express, led by composer/violinist/vocalist Alicia Svigals, the world’s leading klezmer fiddler and a founder of the Grammy-winning Klezmatics. Steve is a teacher, choreographer, and performer of Jewish dance, particularly Yiddish dance, the dance to klezmer music. He has often been called the “Pied Piper of Yiddish Dance”; his years of experience leading and researching Yiddish dance allow him to quickly weave dancers and music together in astonishing ways. Young and old, from all backgrounds, find it easy to share in the joy of Yiddish dancing.